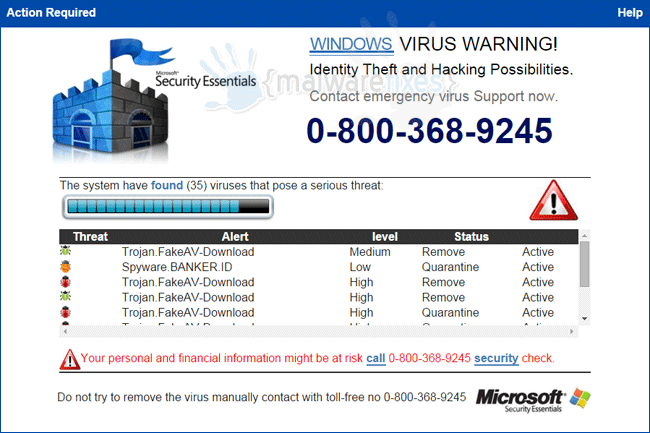 “Windows Virus Warning” is a pop-up that purported to be a valid warning of legitimate program. In reality, this is a fake web site that tries to deceive computer users. It issues fake warnings and alerts prompting visitors to call a number and seek for technical support. Be aware that programs and services offered are not free. “Windows Virus Warning” was created to scam computer users and steal money through fraudulent online transactions. When your browser is redirected to “Windows Virus Warning”, or pop-up appears as you browse the Internet, it may mean that your computer is infected with malicious code. In contrary, your PC may be clean and the appearance of “Windows Virus Warning” pop-ups was just caused by an infected web site you are viewing. Remember that site “Windows Virus Warning” is malicious. Thus, you must avoid it to keep your computer safe and away from adware or malware threats. Identity theft and hacking possibilities. Contact emergency virus Support now. In order to prevent “Windows Virus Warning” attack, you must take extra caution when visiting web sites particularly unknown ones. As much as possible, avoid downloading unfamiliar freeware or shareware that are commonly the carrier or adware and other malicious programs. To completely remove “Windows Virus Warning” adware and stop the pop-up ads, you may have to scan the PC with legitimate security tools and virus removers. Removing any relevant software also helps eliminate unwanted items on the computer. 4. It searches for presence of harmful programs, plug-ins, add-ons, or any data that were found malicious and linked to “Windows Virus Warning”. You need to Clean all items detected by this tool. After the previous scans, you may have deleted “Windows Virus Warning” from the affected browser. This next step will ensure that no more module of adware will be left on the browser. This free tool scans and checks the browser for unwanted add-on and extension, and if found, Avast Browser Cleanup will give you a report and suggestion. 4. Avast Browser Cleanup will confirm before it permanently deletes the add-on. Please click Yes to proceed with the removal of “Windows Virus Warning” on the affected browser. Cleaning your internet browser from clutter and unwanted add-on/extension is a must when dealing with “Windows Virus Warning”. The procedure below discuss on resetting various browsers to its default state. Resetting Google Chrome to default settings is helpful in deleting hard-to-remove extension such as from “Windows Virus Warning”. This method is highly advisable to perform if you have difficulty in removing unwanted extension. 6. Close the existing tab and restart Google Chrome. That should have removed “Windows Virus Warning” extension. 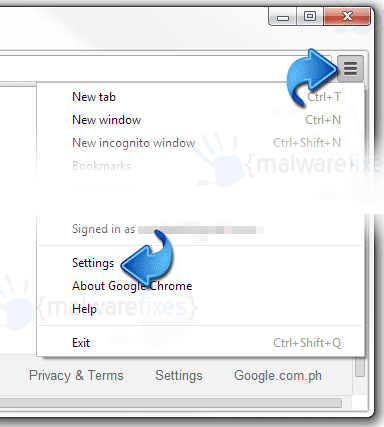 This section describes how to remove unwanted extension from Firefox that may be related to “Windows Virus Warning”.. This process can fix many browser issues by restoring Firefox to factory settings without affecting your essential information (bookmarks, browsing history, passwords, and Internet cookies) on the browser. If you desire to remove only specific extension, please see manual removal of add-on from Firefox. 4. Firefox browser will close and start the resetting process. When done, it will display a list of restored data. “Windows Virus Warning” should be gone by now. Click Finish to open a fresh version of Firefox. Your data like favorites, bookmark, and history will remain in the browser. However, this process may delete add-ons by “Windows Virus Warning” and other unknown objects. If you prefer to carry out the procedure manually, please add-on removal from Internet Explorer.